Example of flat polished edge-work on a glass table top, our most popular option! Whether it's a brand new piece of furniture or a priceless antique family heirloom, nothing protects the surface of your table or nightstand like a glass top. Essentially maintenance free, glass tops from National Glass will protect your furniture from everyday wear and tear as well as help prevent damage from falling objects. A glass top can literally last a lifetime and cost a fraction of what a fine piece of furniture costs. Call National Glass today or visit our showroom to see physical samples of glass and edge-work for the many tabletop options we can provide. Not only can we make tabletops in ¼”, ⅜”, ½” and ¾” glass, but we can provide a variety of tinted, colored glass and ultra-clear low iron glass to realize that vision you are looking for. Interested in a decorative bevel on the glass or custom edgework? 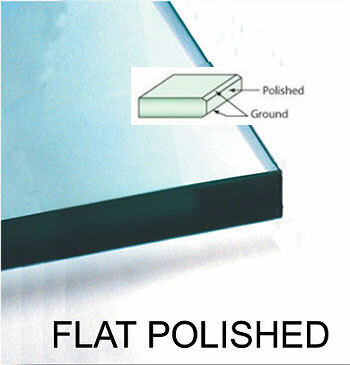 Whether your design needs call for a simple flat polish or something unique, National Glass has been providing custom cut glass tabletop solutions for over 50 years!